Every once in a while, I like to go through some of my old recipes, and give them a little facelift. Tweak some of the ingredients, take some new pictures, etc. So, how do I decide which recipes to tweak out of ALL the recipes I've ever done? Food holidays of course! You knew they had to be good for something, right?! July 11th happens to be National Blueberry Muffin Day, and what kind of food blogger and dietitian would I be if I didn't make sure you were prepared with the absolute most perfect, no added sugar, blueberry muffin recipe on hand?? This Blueberry Chia Muffin recipe re-do is out of this world. So, what did I change? First, I swapped the honey for date paste. I find that out of all the natural sources of sugar that I can use to sweeten a recipe, my blood sugars respond best to dates... as in they don't spike up super high like they do with honeys, syrups, agave, etc. (I'm a type 1 diabetic, in case you missed that little piece of info.) Also, I like that this new and improved Blueberry Chia Muffin recipe isn't overly sweet. My husband (a self-proclaimed sugar addict), and my girls (ages 2 and 3) really like them, and I don't have to worry about their taste buds getting addicted to a super sweet taste. Second, I changed the ratio of coconut flour to liquid and added in some extra lemon juice... both the texture and flavor in this new recipe are nothing short of perfection! 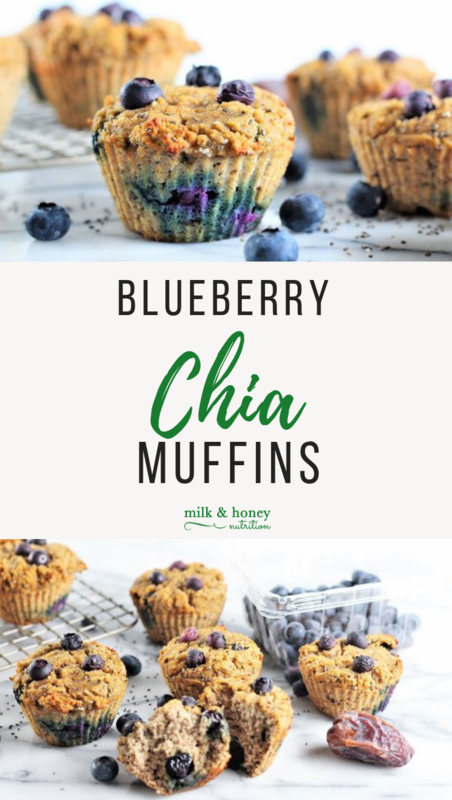 So, if you make these new and improved Blueberry Chia Muffins, be sure to let me know with a comment below, or tag @milknhoneynutrition on Instagram so I can see your creation! These gluten free, grain free, dairy free, blueberry chia muffins are an amazing way to start your day, a tasty afternoon pick me up, or a guilt-free night time snack! Combine the dates and water in a small saucepan and bring to a boil. Let boil for 10 minutes with lid on. Remove from heat and let it cool for 10-15 minutes. Place dates and 1/4 cup of liquid in food processor and process until smooth. (You may need to stop and scrape down the sides 1-2 times.) Store in a small mason jar or another container with a lid for up to 7 days. Check out these other recipes with no added sugar!